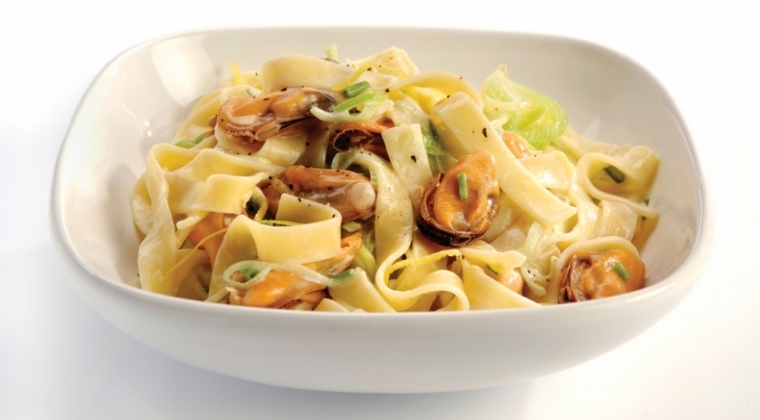 Cook 400 gram of tagliatelle. Wash an orange and a lemon, zest both and squeeze the juice. Fry a finely chopped leek and the lemon zest in 25 gram of butter for three minutes. Add coarsely ground pepper, a teaspoon of sugar, the lemon juice, a dash of white wine and a spoonful of fish stock powder and leave to reduce to half. Add 0.25 litre of cooking cream and leave to simmer until the sauce begins to thicken. Add salt and pepper to taste. 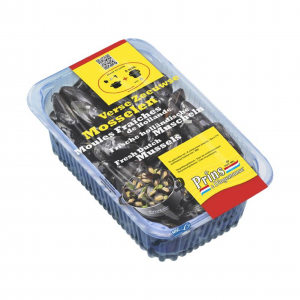 Add 500 gram Prins & Dingemanse pre-cooked mussels. Heat them for a little while. Add the tagliatelle and a few tablespoons of finely chopped chives. Serve in large deep plates. Serve with a fresh salad. Use curry or saffron to add extra flavour. Either goes extremely well with this sauce.